Milestone AV Technologies, parent company of the Chief, Da-Lite, Sanus, and Projecta brands, has launched a new website with expanded functionality to better serve customers. This is the result of an extensive, two-year customer engagement process to help determine the best way Milestone brands can become the easiest partners to work with. Milestone's new website presents users with one place to specify, configure, price, and order from all of the company's brands. 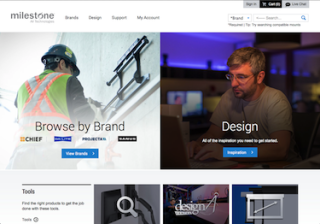 Milestone's new website presents users with one place to specify, configure, price, and order from all of the company's brands. "We have a successful history of following installers around, watching how they use our products, and then developing even better ones," said Laurie Englert, vice president, customer experience. "We decided to aim that same process at developing the next level of service for everyone in our customers office from engineering to purchasing. The real ‘a-ha’ moment was realizing we didn't necessarily need something new, we just needed to do what we do better." The path to the new website started two years ago. A cross-functional team of employees from departments all over the organization were gathered to form a customer experience initiative that would examine every step along the customer path to find out where Milestone was excelling and where the company could do better. The new site provides one place to specify, configure, price, order, and track. When customers log in, they will be notified immediately of any issues with an order, what the issue is and how it is being resolved. Customers will be able to find out their product status, pricing, availability, and more. It is also responsive, which means the site will automatically resize and realign content to accommodate the screen sizes of tablets and smartphones. So no matter how customers access their info, it will be easy to read. Historically, Chief, Da-Lite, Sanus, and Projecta have operated as separate brands. The brands will continue to live as such, and this first evolution is focused on commercial brands only. However, customers who have been specified as a purchaser of Sanus products and who are logged into the website will be able to add these products to orders. The Projecta brand, sold primarily in Europe, will also be incorporated in the coming months. The new site is online at milestone.com. The individual brand sites will remain for an interim period of time.